by Mark Stephenson. Abingdon Press, 2011. Mark Stephenson, known nationally as the “Church Cyber-guy,” has been a volunteer leader since 1997 at Ginghamsburg UMC where he developed a website that hosts more than 50,000 visitors per month and where he currently directs their internet ministry. 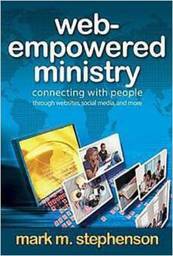 His book, Web-empowered Ministry, is written in an engaging and readable style. In it, Mark unpacks the process of developing an internet ministry from the ground up: assembling a team, designing and maintaining a website, and developing a presence on Facebook and Twitter. This book is a comprehensive guide that provides practical steps, techniques, and ideas to develop an excellent and effective web ministry. Stephenson, also founder and director of Web-empowered Church.com, sees the internet as a powerful tool to share, teach and connect people with Jesus Christ. This book is an excellent choice for Christian leaders with limited technological knowledge but a strong interest in learning what it will take to develop a stronger web presence for their church.